Implant prices in Mexico can be less than half the price charged by a US dentist. All of the implants used in our Mexico clinic are purchased from US suppliers. The implants are made of titanium. Our trained implant dental specialist will take an all encompassing x-ray of your mouth. The dental practitioner will likewise The dentist will also take some measurements of your jaw bone to make sure you have enough bone to support the implants.. Provided that this is true, the dentist will surgically place the implants. Most patients experience insignificant pain during this procedure. The specialist puts the implants in your bone. Once the implants are set up, they should heal for around 6 months. During this recuperating period, the implant will bond with your bone and frame a changeless bond. You can wear a partial denture over your implants amid this recuperating stage. Your Mexico dentisr can take impressions of your mouth and have a fractional denture prepared for you the day after the implants are put. After your implant has healed, you will need to return to our Mexico clinic to get the final crown placed. The dentist will activate the implant. This means that the dentist will remove the healing cap and place an abutment inside the implant. The abutment will stick up above the gum line, and the crown will be cemented onto this abutment. The dentist will take an impression and send it to the dental lab. The lab will deliver the crown about 4 days later. The dentist will make sure the crown fits perfectly, and you will have a chance to approve the fit and appearance before the final crown is cemented. Once the dentist cements the crown, you are finished! Implants in Mexico are a real bargain. 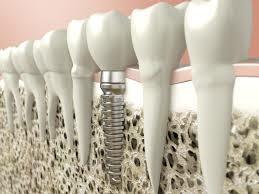 The implants used at Brio Dental are high quality titanium, and are finished off by top quality crowns. Implants are the best treatment option to replace missing teeth, and our Mexico dentists are waiting to hear from you and to restore your smile.